The SE5000 Exakt Duo2 is engineered to meet the European driver’s needs. The smartest One Minute Rule digital tachograph yet, it comes as standard with our tried and tested Duo Technology, the decision support tool that gives drivers real-time updates on driving and rest time. It enables them to easily keep track of their journey, optimize their time on the road and helps to stay legal and reduce infringements by an average of 60%. The Duo Technology has also been enhanced with Working Time Directive calculations and ferry and train support. **Apps require purchase of tacho link dongle. 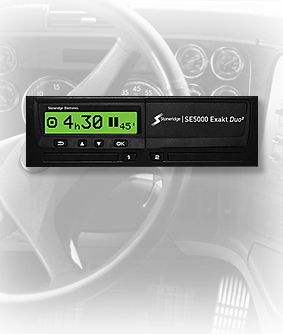 For more product information on the SE5000 Exakt Duo2 tachograph, including videos and an in-depth online training tool, please visit http://www.SE5000Exakt.com.